This pattern is available both in Japanese and English. You can download both versions at once. 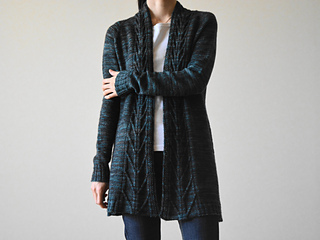 A cardigan knit from back neck toward the bottom in one piece. Two lines of dynamic cable patterns on both fronts were inspired by branches and small flowers growing in layers. The same pattern is designed at the center back, although this one grows larger as it goes down, and is divided into two lines toward the sides. 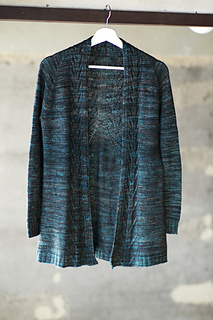 This A-line shaped cardigan will become an elegant addition to your fall wardrobe. The sample was knit in size S with 4.5” / 11 cm positive ease. 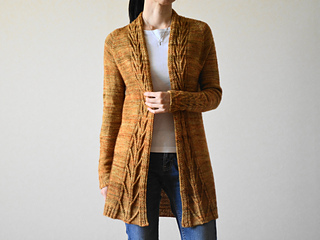 The cardigan is worked from top down, entirely seamless. 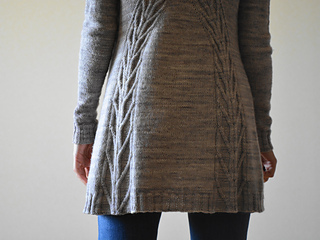 Work neckband at first, then pick up stitches for front, back, sleeves from the neckband. Work raglan increases to shape the yoke. At underarm, sleeves are set aside and the body is worked flat to the hemline. Sleeves are worked top down in the round using magic loop method. 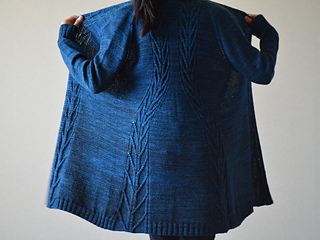 If you have any question, tips for knitting, etc., please post in amirisu group. 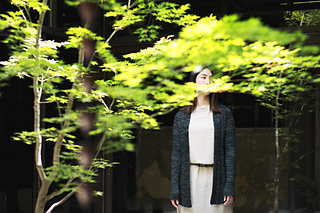 amirisu will coordinate with the designer to answer your questions. 余裕: 後衿~身頃脇下まで +0 - 2.5 cm, 胸囲 +7.5 cm モデルはSサイズを着用し, 余裕として +11 cm. 最初に左右のネックバンドをそれぞれ長方形に編む. そこ から前後身頃と袖の目を拾って, ヨーク全体を増目しなが ら脇下まで編み進める. 袖の目を一旦休め, 前後身頃を一 緒に裾まで編む. 袖は袖口に向かってマジックループで輪編みする.